The Romania national rugby union team (Romanian: Echipa naţională de rugby a României), nicknamed The Oaks (Stejarii), is the representative side of Romania in rugby union. Long considered one of the stronger European teams outside the Six Nations, they have participated in all seven Rugby World Cups, and currently compete in the first division of the European Nations Cup, where most recently in the 2012–14 competition they finished second. Rugby union in Romania is administered by the Romanian Rugby Federation. The team plays in yellow and blue strips. France first played rugby against Romania in 1924 when they tried to establish a rival to the Five Nations championship. Although not regarded as a top-tier team in more recent times, their history includes wins against four (France, Italy, Scotland, Wales) of the Six Nations Championship teams. Romania have played in every Georgia have challenged Romania for top spot below the Six Nations, and Georgia, along with Portugal have both won the European Nations Cup (or Six Nations B). The game itself was introduced by students returning with rugby balls from their studies in Paris to form clubs such as Stadiul Roman from 1913 onwards. Seventeen other teams would be formed in the capital, Bucharest. Romania's first international was played against the USA in 1919. France first played rugby union against Romania in May 1924 when they tried to establish a rival to the Five Nations Championship (now the Six Nations). France were victorious by 59 points to 3. Romania were one of three teams who entered the 1924 Olympics in Paris. France won 59–3, scoring 13 tries including four by the fine Stade Francais winger Adolphe Jaureguy. The USA then defeated Romania 39–0. Romania finishing third claimed the bronze medal. The Federaţia Română de Rugby was formed in 1931. In 1939 a team was formed in Braşov at an aircraft factory. This was the first team outside Bucharest. The communist regime used rugby union like it used other sports, as a propaganda tool during the Cold War with the West. Every international success was presented as a direct result of the righteousness of the communist rule and ideology. All the financial resources were directed toward the preparation of the national team to the detriment of domestic development. Top players were employed in the army or the police, whose sides CSA Steaua București and Dynamo practised six days a week in superb sporting centres. These infrastructures bred a talented national side. A generation of French school trained coaches from late ’40s, and ’50s built a system and led the national team to success of the 1960s, ’70s and early ’80s. In this era Romania began to compete more regularly against the major nations. Their first win over France came in 1960 in Bucharest, in a friendly tour match won by 11-5. In 1974 Romania won against France 15 – 10 in Bucharest, and the FIRA – Association of European Rugby championship. In 1975 Romania went for an 8 games tour to New Zealand, tour concluded in Wellington with a 10-10 draw against Junior All Blacks. Exposure to international rugby developed the country's game and they began to form their own distinctive style of play, built around giant, bruising packs. That Romania was emerging as a real force on the world stage became clear on their 1979 Romania rugby union tour of Wales at Cardiff Arms Park in 1979 in an unofficial, non-cap match. The Oaks led going into the dying minutes, when only a last-gasp drop goal from Gareth Davies gave a narrow 13–12 victory for Wales. The improvement continued in 1980, when Romania crushed the French in a record 15–0 win in Bucharest. A trip to Lansdowne Road in the 1980 Romania rugby union tour of Ireland then yielded a 13–13 draw against Ireland in another unofficial, non-cap match. In the 1980s the country boasted more than 12,000 players in 110 clubs. Home nations sides began to award international caps for matches against Romania in 1981; Scotland were the first to do so when Romania visited them on their 1981 tour, Scotland winning the international by 12 points to 6. Wales travelled to Bucharest in November 1983 and were totally overwhelmed, falling to a 24–6 defeat. Romania's first win over Scotland came in Bucharest in 1984 and their first away win against Five Nations opposition came in 1988 against Wales; 15–9 at Cardiff Arms Park. Their national side beat Wales (twice – 1983: 24 – 6 in Romania, 1988: 15–9 in Wales), Scotland (the 1984 Grand Slam side 28 – 22 in Romania), France (twice 1980: 15 – 0 in Romania, 1982: 13 – 9 in Romania) and drew with Ireland (13–13, in 1980, at Dublin). In 1981, they lost to the All Blacks 14–6 but had two tries disallowed. Many felt it was wrong for the rugby union powers to fail to bring them into top-flight competition. There are even rumours that the Oaks were invited to join but refused because the championship took place during their winter break. Romanian beat Zimbabwe 21–20 in their first ever Rugby World Cup match in 1987 but did not win any other games and failed to progress beyond the group stage. 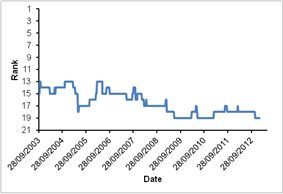 However, with the deterioration of the domestic political and economic situation in the country in the 1990s, Romanian rugby union suffered; the two leading rugby union teams – Dinamo Bucharest and Steaua Bucharest, represented the police and the army respectively, so their state funding fell. Post-revolution, Romanian rugby union was still alive and kicking. In 1990 they recorded their best win to date by beating France 12–6 on French soil for the first time. The following year they beat Scotland 18–12. At the 1991 World Cup they managed to beat Fiji 17–15 and as recently as the 1995 World Cup, Romania held the eventual winners South Africa to a highly respectable 21–8. The professionalism that followed immediately upon the heels of that World Cup was the undoing of the sport in Romania. Approximately 200 Romanian players are thought to be playing in France and Italy. It wasn't just playing numbers that suffered, but a whole generation of potential referees and administrators was lost to the game. By 1994 Romania's rugby fortunes had declined sharply, when a Welsh team travelled to Bucharest for an uncapped international the visitors came away with a 16–9 win. In 1997 the Romanians toured Wales. They lost 36–21 to Wales A at Pontypridd and 70–21 in a test held in Wrexham. At the 1999 World Cup Romania could again only manage a single win 27–25 against the United States. Romania versus Ireland at Lansdowne Road in 2005. In 2000, Romania won the first European Nations Cup, crowned with a decisive 31–20 win over Romania in Bucharest. The national side lost to England by 134–0 in 2001 and Dinamo Bucharest lost 151–0 to Saracens in the European Rugby Shield. Several French-based players refused to turn up for the England debacle simply because their clubs refused to pay them for the week. Players in that Romanian squad were getting £30 a day in expenses while England's top earners scooped £6,000 for their afternoon's work. In January 2002, Bernard Charreyre was appointed coach of the national team both supplied by and paid by the French Rugby Federation (FFR). Under Charreyre (known by The Oaks as 'Little Napoleon'), the Oaks’ decline has been stopped and the team has started to slowly climb from the basement of international rugby union. With a change of format in the European Nations Cup, Romania started in 2002 trailing Georgia due to the inclusion of 2001 results. The Oaks managed to win all of the remaining five games, including a hard-fought 31–23 victory in Tbilisi to win the tournament. They qualified for the World Cup in 2003, where they beat Namibia and lost to Ireland (45–17), after an honourable display, and then to Australia (90–8) and Argentina (50–3). Charreyre was dismissed after the World Cup as the Romanian Federation was not satisfied by the World Cup performance and decided not to renew his contract. Three other French coaches followed: first, Phillipe Sauton, for a very short period, Robert Antonin as a temporary stand-in and then Daniel Santamans. In the 2003–2004 European Nations Cup, Portugal were surprise 16–15 winners over Romania in Lisbon and installed themselves on the top of the 2003 table. In the second half of the competition, Romania seemed back on track (36–6 against Portugal in Constanţa), but went down 24–33 to Russia in Krasnodar following allegations of players having been doped. Then Portugal clinched their first title with a last-minute 19–18 win over Russia in Lisbon. In 2004, the Romanians scored a narrow 25–24 victory over Italy, their first victory to date over a Six Nations Championship side. In 2005 Romania was given 'second tier' status by the IRB and replaced Russia in the Super Powers Cup. The USA beat a Romanian team stripped of their France-based players 23–16 in the third place play-off. The 2005–06 European Nations Cup also served as a qualifying group for the 2007 Rugby World Cup. Romania triumphed despite finishing level on points with Georgia. Romania qualified for the 2007 Rugby World Cup in France, finishing at the top of their pool during the Round 5 of the European qualifying tournaments. Romania won their first qualifying match on October 7, defeating Georgia in Bucharest 20–8. Their 43–20 win over Spain in Madrid on October 14 ensured that they qualified directly for the World Cup in 2007. In June 2007, Romania hosted the IRB Nations Cup in Bucuresti. In the 2007 Rugby World Cup finals, Romania managed to win a bonus point in the 18–24 loss to Italy and to win a second game with Portugal by a narrow margin (14–10), but suffered heavy losses to Scotland (42–0) and New Zealand (85–8). On 21 March 2009, Romania lost 22–21 at home to Portugal, leaving them with an uphill struggle to qualify for the 2011 World Cup – qualification for which is determined by performances in the European Nations Cup in 2009 and 2010. Romania went unbeaten, with a draw at Russia, in the 2010 phase of the European Nations Cup. The Oaks' strong finish put them in third place and the final phase of the European qualification playoffs, in which they easily defeated Ukraine over two legs (94–10 on aggregate) for the European place in the Final Place Playoff for the 2011 Rugby World Cup. Romania emerged as the last qualifier for the 2011 Rugby World Cup in New Zealand by overcoming first Tunisia in a winner-takes-it-all game (56–13) and later Uruguay (60–33 on aggregate). Thus, the Oaks are one of only 12 teams to participate at all World Cups alongside New Zealand, Australia, England, France, Wales, Ireland, Scotland, Italy, Argentina, Canada, and Japan. Romania's only annual tournament is a competition involving Europe's tier 2 and tier 3 national teams. From 1936 through 1938, they competed in the FIRA Tournament against France, Germany and Italy. In 1965 till 1973 the FIRA Nations Cup was formed allowing other teams to be promoted or relegated from the competition. Romania won the competition once in 1969, being the only team to defeat France. Romania has competed in every Rugby World Cup since the inaugural tournament in 1987. Their best finish was with one win in 1987, 1991, 1999, 2003, 2007 and 2015. They lost all pool matches in 1995 and 2011. So far Romania has not hosted any World Cup games, but it may put in bids for future tournaments. Below is table of the representative rugby matches played by a Romania national XV at test level up until 11 October 2015. Romania 31-man squad for the 2015 Rugby World Cup. On 29 September, Vlad Nistor was called up to the squad to replace Ovidiu Tonita after suffering an injury during Romania's game with Ireland. Romania's current top point scorer of all time Florin Vlaicu. The 1924 Romania Olympic team are the only Romanian inductee to have been inducted into the IRB Hall of Fame. Nicolae Mărăscu captained the famously Hall of Fame side. The highest point of Mărăscu's career was at the 1924 tournament earning Romanaia the Bronze medal. He played as a Centre (rugby union) and had five caps, without ever scoring, since his first match, in 1919, a 48–5 loss to France, in Paris, for the Inter-Allied Games, and his last, at 22 May 1927, in a 21–5 win over Czechoslovakia, in Bratislava. Iulian Dumitraș was Romania's main man. Dumitraș was known to be one of the Oaks' most gifted playmakers, with an accurate kicking boot and a penchant for sparking attacks. Having made his test debut in 2002, he went on to start in every match a Rugby World Cup 2007 in France, bringing plenty of experience to the nation. The then standing 1.88m and weighing in a 110 kg, Dumitraș was a punishing runner when he chimes into the line on attack, which he looked to do often, and he provided a solid and dependable last obstacle in defence. Sorin Socol is regarded by many good judges as the then best player in the current squad and was one of the rocks of the Romanian forward pack. He has captained the most matches to date for Romania, between 2003 and 2011. A total of 61 tests, 36 of them were as captain. He captained Romania for the first time on 30 October 2003 during the 2003 Rugby World Cup match against Namibia. He went on and featured in the 2007 World Cup squad and eventually retired from all international rugby after the 2011 tournament. Socol had one of Romania's highest winning percentage as a captain of 63.88. Florin Vlaicu is Romania's top ever point scorer. Vlaicu plays made his international debut in 2006 as a substitute against Ukraine. He played for Romania in the IRB Nations Cup and in their 2007 Rugby World Cup qualifying before appearing for them in the 2007 Rugby World Cup. He played two Tests at the World Cup as a substitute against both Scotland and the All Blacks. He also played at the 2011 Rugby World Cup. Cristian Petre is Romania's most recognized player after dominating the lock position for eleven years. He is Romania's most capped player with a total of 92 matches and a career span that started in 2001 against England and ended in 2012 against Italy. Petre has featured in three Rugby World Cups, first in 2003, going on to feature in 2007 and his last being in 2011. Petre has scored a total of six tries and had winning percentage of 55.43. Spain and scored a try against Spain in the game that sealed their qualification to the Rugby World Cup. Fercu was a late withdrawal from their Rugby World Cup squad in 2011 because he was not prepared to fly all the way to New Zealand. The Romanian side arrived in Christchurch to prepare for their first game of the tournament against Scotland in Invercargill on 10 September without Fercu, who failed to get on the plane when it left Romania. Another one of the Oaks greatest players are Romeo Gontineac, represented Romania in four Rugby World Cups from 1995 to 2007. The hard running centre, who became the national coach in 2010, was capped 75 times for the nation, scoring 13 tries and a drop goal. During his career he played professionally in Romania, South Africa and France. Last updated: Romania vs Italy, October 11, 2015. Statistics include officially capped matches only. Last updated: Romania v Italy, October 11, 2015. Statistics include officially capped matches only. 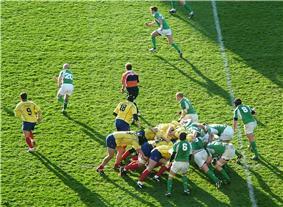 Romania's European Nations Cup matches, mid year tests and autumn internationals are currently televised by TVR1. Between 2007 to 2011, Romania's kit were supplied by O'Neills. KooGa took over from there and have remained Romania's kit suppliers. ^ "Romania expand their horizons". 25 August 2015. Retrieved 25 August 2015. ^ "Romania call up Vlad Nistor for injured Ovidiu Tonita". Rugby World Cup. 29 August 2015. Retrieved 29 August 2015.